WRITER: Tim Herlihy, Timothy Dowling. Based on a short film by Patrick Jean. PLOT: When aliens misinterpret video feeds of classic arcade games as a declaration of war, they attack the Earth in the form of the video games. Patrick Jean’s animated short film Pixels is a work of genius (see the video below), so it came with little surprise when Hollywood banged on his door with an open chequebook and plans to turn his vision into a fully fledged blockbuster movie. Unfortunately, it was Adam Sandler’s production studio that knocked loudest. Happy Madison are the makers of almost exclusively terrible ‘comedies’ aiming for the lofty heights of American Pie and Dumb and Dumber rather than The Great Dictator or The King of Comedy, so a nuanced script with witty observations and thrilling twists was never on the cards. Even so, the critics have been particularly harsh on a film that they were expected to hate. Being a big retro gamer the tale of intergalactic warfare between 40 year old arcade champions and aliens in the guise of classic game characters was right on point and dampened some of the initial trepidation from Sandler’s involvement. The film starts badly. Moving at incredible speed to whizz far to quickly through the meeting of the film’s heroes at the 1982 Worldwide Arcade Game Championship, to 30 odd years later where they have remained unlikely friends given that one is now the president and another is a low level installation engineer for an electrical retailer. Cue the engineer fitting a guilt TV and Playstation 4 at recent divorcee’s home, misunderstanding, mutual dislike, realisation that they must work together to save the world, sexual tension and eventual pairing up. Sounds horrible doesn’t it. But to be fair, it never feels as bad as it sounds. The unique selling point of the ‘Arcaders’ teaming up to save the day from classic video game characters hell bent on the destruction of the earth is strong enough to carry the lazy script and run of the mill direction. This enables some genuinely fun moments like the Pac Man chase through New York and the Duck Hunt dog coming to life. Of course on the flip side there are also moments that are woefully undercooked (the Breakout destruction of the Taj Mahal) or ludicrously overdone (the rogue Centipede trying to escape through a residential building). 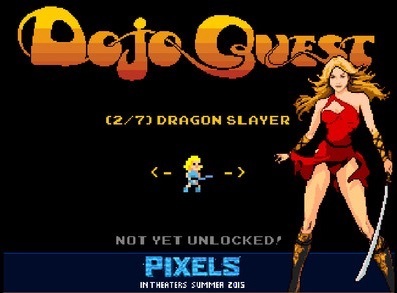 In a similar (though lesser) way that Wreck It Ralph disappointed by skirting with real game characters and then focussing on new IP, Pixels decides to use the fictional Dojo Quest for a number of scenes. Seeing Lady Lisa, DQ’s lead character and object of desire for Ludlow’s (the loser of the Arcaders team) transformed into a beautiful real woman (don’t ask!) is slightly silly, but an acceptable part of the tale. However, there are many games featuring strong and beautiful female leads, so it is sad that a game built on the pull of classic games spurns the likes of Space Ace’s Daphne for what is little more than a marketing ploy to allow the makers to release smartphone advertainment versions of the fake game. I was also left frustrated with the big end game where Donkey Kong is unfortunately not battled out on an Earth building site, but inside a spaceship, completely killing the endearing augmented reality of the films earlier scenes. All in all Pixels is a mixed bag of good, bad and pretty damn ugly film-making. It is a soft story that could so easilly have been elevated to a modern day Ghostbusters (in the hands of a better writer), but it looks nice and carries enough light humour to keep you entertained for 100 minutes. The effects don’t really add anything to what Patrick Jean acheived in his short film that inspired the movie and it is very obvious that the film was deliberately softened to ensure its PG rating (saving us from the standard drug-humour that blights everything else from the Happy Maddison fold). But it is a film that I do not feel embarrassed to recommend if you are looking for a harmless family comedy to save you from a season boasting monstrosities like Ted 2 and Spy. Adds little of value to the short film that came before, but provides enough light entertainment for its short run time that you don’t feel cheated. 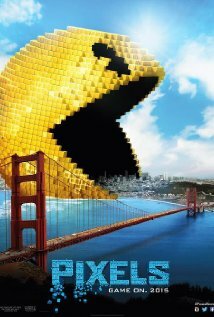 I was really looking forward to Pixels, but I think it was primarily for nostalgic gaming purposes, not for any plot reasons. I think it is worth it for nostalgia.